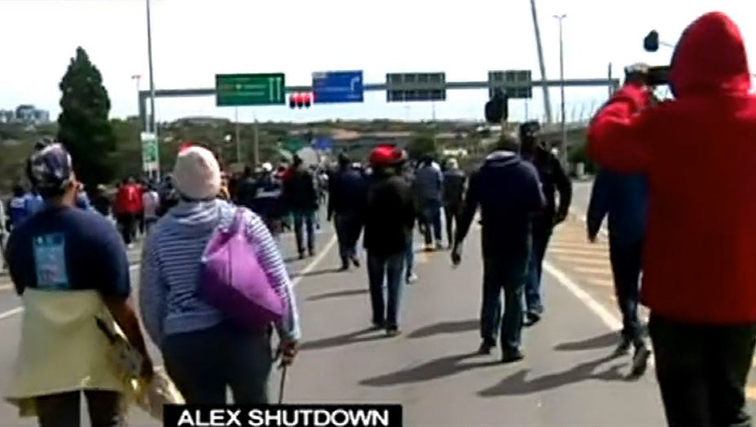 The situation is tense in Alexandra, north of Johannesburg, as residents march towards Sandton. Despite the cold and wet conditions, community leaders are warning that a shutdown in the region will continue if Mayor Herman Mashaba fails to urgently address residents’ concerns. The residents are protesting over what they say is a lack of service delivery in the area. Alex-Total-Shutdown convener, Sandile Mavundla has refuted claims by police that the march is illegal. He says the march is not illegal because they submitted it before in the memorandum and the was no response to that memorandum. Police are monitoring the situation closely. Meanwhile the Alex-Total-Shutdown movement has reiterated that their protest is not affiliated to any political party but rather based on genuine pleas from the community. “We are not affiliated to any political party. They can verify that. The problem with our people is our leaders are always trying to shift the goalpost for our people in terms of service delivery,” says Mavundla. The post Situation tense as Alexandra residents march towards Sandton appeared first on SABC News – Breaking news, special reports, world, business, sport coverage of all South African current events. Africa's news leader..